What if your house burnt down? Have you still â€œmade itâ€? 3 weeks ago I was sitting, much as I do now, winding down on a Saturday evening, finding some time to write a newsletter and blog. 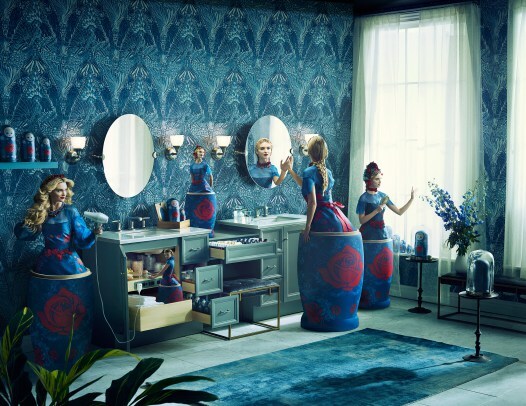 I had just released an image shot for Kohler, a company whose advertising I had wanted to be a part of for a long time, and wanted to write something around this image and the process to create it. Earlier in the day I had listened to Bill Burr being interviewed on Tim Ferrissâ€™ podcast. A good laugh, as always with Bill Burr, balanced by Timâ€™s prodding for life lessons. â€œNo! I tell jokes for a living and I bought a house. I MADE IT! I can so relate, and Bill Burrâ€™s thoughts lingered with me as I started writing. Shooting for Kohler was a long time goal of mine creatively and by Bill Burrâ€™s standard of buying a house I have â€œmade itâ€ several times over. So have I really Made it? I settled in that evening reflecting on what I had accomplished as a photographer and the blog shifted to words about goals and the acknowledgment of reaching them. Of pausing and being content for a moment rather than going straight into the chase of creating another image or landing the next assignment. That was my Saturday 4 weeks ago. That Sunday night we woke up by flashlights shining into our bedroom window and our neighbor shouting the hillsides were on fire. We packed our essentials and got out. The weeks since has been indescribable. The fires around Sonoma and Napa, where we live, burned more than 100,000 acres. Lives were lost and neighborhoods left in ashes. One of my best friends and 5 of our neighbors lost their homes.Â It is devastating. There are many emotions around the 17 days we were in mandatory evacuation and I will write another blog to chronicle the experience.Â My perspective on having â€œmade itâ€ as an artist have shifted during the past weeks and I wanted to finish the blog I started and get back to Bill Burr and his benchmark of having made it. I have learned that a home is absolutely no measure of having â€œmade itâ€ as a creative. TheÂ truth is;We never â€œmake itâ€. We just keep making. I now know this to be the truth. After we left our house that morning I got a chance to go back to grab a few items. I had a shortlist from Andrea; Journals, some jewelry and some additional clothes for our 3-month-old daughter. The main item for me was my server rack containing all my work as a photographer. I ripped it out of the office and by sheer adrenaline got it into the car. I hosed down the house with water and walked through it one last time. I grabbed a few small items as I passed them and unhinged a few framed prints by Nadav Kander, Hiroshi Sugimoto, Mario Testino, Alexi Lubomirski and a few others. In these moments I was strangely ok with the house being gone. I knew then that this house was no measure and had nothing to do with who I am, my selfworth or how much or little I have accomplished as a photographer. Iâ€™m sharing this, as I believe it can help a lot of young photographers starting out. And Bill Burr for that matter. I know there are a lot of talented photographers who have given up on photography. Making a living taking pictures is as competitive as it gets, and a long endeavor if you choose to take it on. What makes this process even harder is the social demands for immediate success. But what if there was no monetary measure attached to successfully creating? What if there was no pressure of even being good at it? What if we would proudly call ourselves photographers without making money doing it? I believe this paradigm would keep photographers in the game long enough to break through to the side of success! As I was starting out I was embarrassed to call myself a photographer. In my hart I was one, but my job was to be another photographers assistant, carrying his gear. It took a long time for me to proclaim that I was a photographer. Why is it so darn hard for us artists/comedians/photographers to early on confidently identify with what we do? Why canâ€™t we just claim our photographer, or comedian, title right out of the gate and then just slowly go about creating? Why do we have to â€œmake itâ€ before we can proudly claim our title? I believe any young photographer would increase his success rate 10X if there were a disattachment between creating and success. If the bar of â€œmaking itâ€ was set so that one would never fail there would be nothing to â€œgive up onâ€. It would only be the process of continually creating and as that continual creating would go on, success would only be a question of time. Experiencing the certainty of loosing my home and how that realization affected me created a shift in my perspective on success and what having â€œmade itâ€ is. If you keep your focus on creating, you have made it. If doing what you do expands you and fills you up, you have made it. If you crave creating every day, you have made it. If you are excited about what you just created and even more excited to improve upon it, you have made it. If you are proud to show your work, you have made it. If you found an expression that consistently expresses who you are, you have made it. If you have done the above so consistently your expression starts to recognize itself, you have made it. If you question why and how and who and explore this through your work, you have made it. You can Celebrate your successes like Bill Burr, but donâ€™t attached them to an event, a monetary item or any other social measure of success. This will yield nothing but downward pressure and distractions to the significance of creating something which deeply resonates with your being. It will leave you feeling like you are coming up short every time. 3.5 of our 5 acres of land burnt and the firefighters stopped the fire just a few feet away from our home. Iâ€™m glad our house is standing. Iâ€™m also glad I had this experience and deeply realize the house is without significance when it comes to who I am as a creative.Â My â€œI have made itâ€ has nothing to do with a fancy car or a home, but to every day do what expands me and fills me up. I will remind myself of this going forward. I will worry less and create more because of it. Like Steve jobs said; Stay foolish, stay Hungry! It is an archetypal event to build or buy a home. Iâ€™m by no means diminishing this fact. In short Iâ€™m saying to not attach anything to your self-worth as a creator. Instead focus on creating and consistency, and measure yourself against your own progress. The word hero gets thrown around a lot. I have not fully understood, or felt, what a true hero was till now. The fire firefighters and individuals who fought the fires in Napa and Sonoma are my heroes. These men and women will all be my heros forever. The Kohler assignment was an extraordinary one. We started with the design of the dress. The fabric, color, pattern and form was designed for the shoot and sown to fit the model. This design informed all the other elements and creative choices of the image. I absorbed the fact that the house would burn with a strange disattachment. The news that it had survived however brought big tears of relief and gratitude. My heartfelt thoughts and prayers go out to those less fortunate. The post What if your house burnt down? appeared first on Erik Almas Photography.